A Clean Sweep with Punchtime! When we were creating our new app, we spent a lot of time thinking about Punchtime’s functionality and we specifically designed it for a range of workers employed in the mobile labour force. We kept the needs of both employees and employers squarely in mind as we developed and tested it. We expected our main users to be in the trades or to be technicians making service calls for repairs or installations. In addition, we imagined it would be helpful to sectors that have fleets of vehicles such as trucking and transport. It turns out that our fastest growing customer base is the cleaning industry. Today, more than any other time in history, there are lots of options for time keeping. From traditional hand written spread sheets and punch clocks to fob and call-in systems. But we’ve now entered a new technological era where employers can manage their employees using smartphones. Punchtime started developing this technology in 2013. All along, the main objective was: produce an ultra simple, well-designed, affordable solution for time tracking. 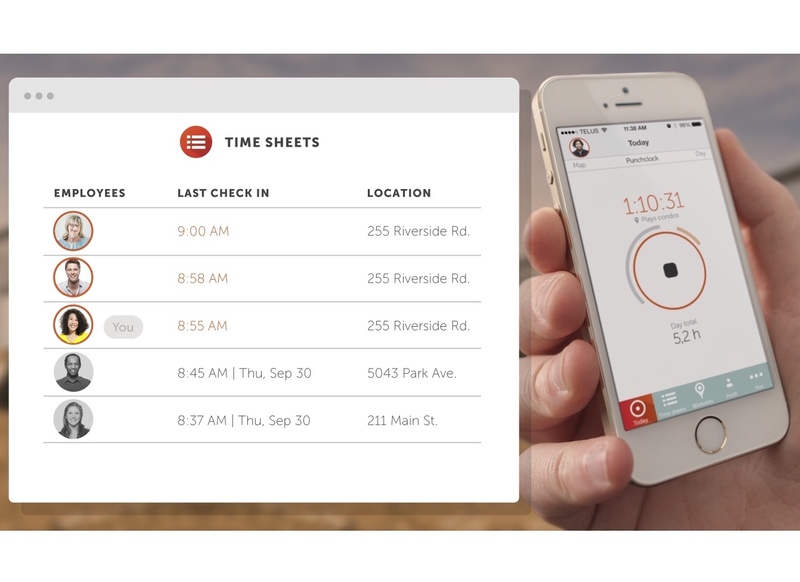 Punchtime collects time and location data from employees’ smartphones. It’s easy as pie: employees clock in with their phones when arriving on location and clock out when they leave. All the information is available to the supervisor or owner from any smartphone, tablet or PC. And the costs to the employer are low: only $4 a month per employee and there’s no contract with finicky fine print. In Canada, the residential cleaning industry alone is worth more than $3.6 billion annually. Home cleaning services have never been in higher demand in Canada, largely on account of the huge number of two-income families. In the cleaning categories, the Ottawa Better Business Bureau currently lists 11 House Cleaning businesses, 6 Cleaning Services, 10 Janitor Services, and 12 Window Cleaning services. Naturally there are many, many more cleaning companies in our region but this gives a sense of the scope of the cleaning industry. We get great feedback from our customers. We’ve often heard that having Punchtime helps reduce or avoid confrontation between the employee and employer when it comes to hours worked. In the past, when the hours just didn’t add up, it gave rise to conflict. Now the employee and employer both have access to the same information. That level of transparency helps with employee retention and the data can even be shared with the company’s clients to confirm hours worked at a particular location. If you’ve got a mobile team of employees, Punchtime is worth trying out and experiencing all the benefits it has to offer. Affordable, reliable, and user-friendly for both staff and management, it runs on most smartphones. It sure beats old-fashioned time sheets and other methods out there!